Thus, the capture-and-release program was born. We strive hard to handle the animals minimally, compassionately, and as efficiently as possible. 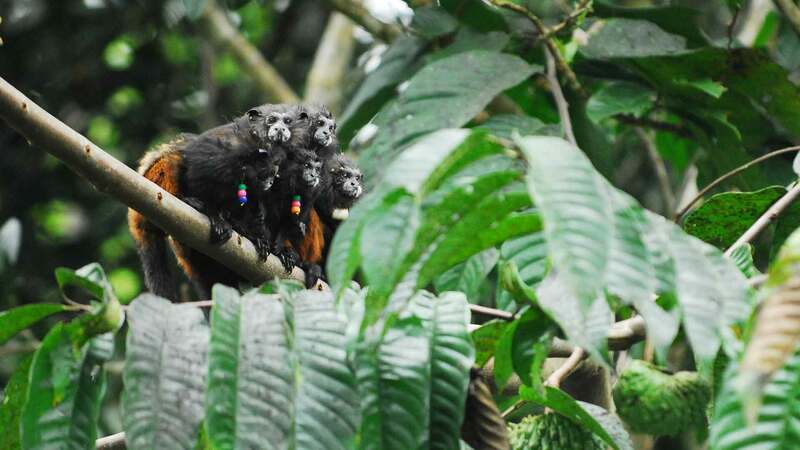 We also gather as much information from them as we can, resulting in what is now a multi-year project of annual health checks that offer an unprecedented view into the fascinating biology of free-ranging tamarins. If you want to truly understand a population, you have to study it on the level of the INDIVIDUAL. In the case of the two species of tamarin at Los Amigos - saddleback and emperor tamarins - this is particularly difficult to do due to their incredible morphological similarity to one another. To begin, adults only weigh 350-600 g. They have been likened to "rats in the rainforest canopy". Adults look alike and they have identical-looking twin offspring that attain adult size in under a year. It is virtually impossible to distinguish between them reliably in their environment. 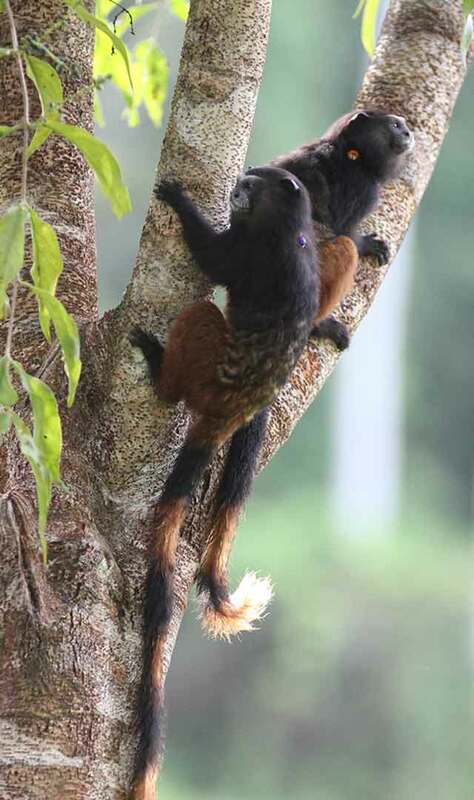 The mark-recapture program focuses on saddleback and emperor tamarins primarily, although Goeldi's and titi monkeys are also included opportunistically. We conduct a single annual capture of each animal within the study population who is still alive, averaging ~60 - 70 animals each year. We place temporary and visible, as well as permanent but invisible, identity tags on each individual captured. In addition, we collect several biological samples, measurements, and do a thorough health assessment. Several animals have been recaptured up to five times in their lives, and display no loss of habituation to human observers - a result of our safe protocol that involves group captures and same-day releases. All animal handling has been approved by Animal Studies/IACUC Committees, and by the Directorate of Forestry and Wildlife Services in Peru also. Alfonso Zuñiga is our wildlife veterinarian. Every successful day begins with a long hike, in the dark of an early morning, where familiar trails take on a foreign aspect. We carry everything we need with us in 40 lb packs, and hike rapidly to the designated capture location. We have 8 to 10 locations staked out, where both tamarin species are habituated to bait for 4 to 6 weeks each year. By going to them, instead of bringing them to camp, we reduce processing times significantly. Once at the site, our team of 5 people splits into two. Here, you see one group carefully place bait within each compartment of the trap. Our ultimate goal is to capture entire groups so as to not disturb their social organisation. Each trap door is controlled manually by string tied to a control rope ~15 m from the site. We do not hide ourselves (except under a mosquito net, for the sakes of our skins) from the animals. They enter only if they want to. As the sun rises slowly, the second team sets up a processing station in a modified tent some distance away. Inside it are three team members unpacking our gear, sterilising it, and laying it out in a pre-defined manner on a foldable cot that serves as a table. "In the field," says Mini, "you have to use urban inventions in ways they were never meant to be used. So, we improvise." And then, we wait. Every field biologist knows that no matter what you do, patience is the most valuable asset you develop - that and the ability to awaken from a light slumber in cramped conditions at the slightest rustle of leaves or softest tamarin tweet. Waiting is hard work. No, really. When it happens, it's generally with little warning, perhaps a few soft calls and some light jumps. We immediately reach out to grab the strings, 4 apiece, faces screwed up in concentration. Here Efstathia Robakis is preparing to record tamarin vocalisations. Quietly, and without startling them, we pull the compartments shut as animals enter. "Three minutes, and it can all be over," says Gideon. "This is also when we tend to get botflies, while unable to swat mosquitoes." As soon as we have the group inside, we carefully bring the trap to the ground. This can be stressful to the animals, so we make sure it is an efficient and practiced transition. Covering the entire trap in tarpaulin immediately calms the animals. Now, we're ready to begin a very long day of work. We take no breaks, so that groups are released together well before the end of the day. One by one, each animal is given a small, controlled dose of anesthetic and moved to the processing tent where the team are ready. These students train intensely for days before they handle the monkeys, but are soon proficient at initial assessments such as TPRs (temperature, pulse, respiration), weight measurement and overall body condition evaluations. Tamarins such as the emperor tamarin in this picture are the smallest primates in the neotropics, weighing from 350 to 650 g depending on gender (females are larger), age and species (emperors are larger than saddlebacks). Here Kyra Ambrosio reads the weight of an animal, and Krishna Sharma verifies her reading, while staying prepared for any bag drops. Outside, Mini keeps a general eye on things. The processing tent can get crowded: Lauren Hennes records data while Krishna measures body temperature and Kyra stabilises the tamarin. All team members are vaccinated for rabies (among other things), and have proper protective equipment (gloves, masks, etc.) that is changed between animals to prevent any cross-contamination between subjects. All data are time-stamped and recorded by voice recorders for later verification. Once every animal has been knocked out, they go into holding cages (pictured in purple) where they are monitored every 3 mins. One animal at a time, we begin the bulk of the processing. Here we photograph teeth, genitalia and scent-glands. A comprehensive check for injuries has allowed us to carefully monitor health over time. Incidentally, should it rain, we can transform the tent into a waterproof area where the tamarins (at least) remain warm and dry. Every animal that passes through the capture and release program is given a microchip. That way, we can always recognise an individual, year after year, even when all temporary identification has been lost, appearance altered by age, or group membership changed through dispersal. To date, based on examining chip entry points, we have had no cases of loss in over 150 animals chipped. Reproductive senescence is one of the most hard-to-study features of any wild population due to premature deaths (for eg. due to predation), but we do have some cases of individuals with all canines missing and decaying teeth who still survive several years. For all animals, dentition also provides an insight into determining age as we gradually build up a database of dental wear for individuals of known age. All animals are marked with distinctive tail rings to assist with identification within the group. Here, Gideon applies a bleach concoction to the tip of the tail to turn rust-coloured hair blonde. In 2 to 3 months, the animal will molt and regrow new hair - but it is sufficient for our 2.5 month annual behavioural observation projects. After years of having their hair done, the tamarins show no adverse effects or noticeable behavioural changes to these temporary marks. The highest respect we can give these animals is to never waste an opportunity to collect the most data possible from them. However, their safety is paramount. Balancing the two is not difficult, and here we gather a sample of plucked hair and some clippings of the claw-like nails (called tegulae) for further genetic analyses (See genetic chimerism research project). All tamarins are fully anaesthetised for the entirety of sampling. Although these tamarins cannot transmit naturally occurring strains of tuberculosis to humans, they do carry them. We take buccal swabs to be analysed by Dr. Anne Stone and Tanvi Honap of Arizona State University to keep tabs on this disease. Together we hope to contribute to investigations into the evolution of the mycobacterium tuberculosis complex in humans and other primates. This infant saddleback tamarin has just gifted us with the smallest and most perfect dental mould, which we will eventually make into a cast. The casts are then photographed in high-resolution and specific teeth tracked to evaluate dental wear. Casts also allow us to determine the precise age of infants, using eruption schedules and tooth sizes - an incredible amount of information from a one-minute mold! The last bit of information we collect, should the animal be amenable (as they slowly awake from sedation), is a thorough morphological assessment including 79 measurements taken on both sides of the body. These allow us to statistically tease apart changes in morphology due to growth, development and senescence. We now know chest and waist circumferences, limb lengths, canine sizes, and even nail lengths on over 350 instances of capture. No transformation would be complete without some jewelry. Here an adult female saddleback tamarin is fitted with a radio collar (weighing ~4 g) which will allow us to track her and her group for up to one year. Each year, we recover collars and place new ones on dominant females who are unlikely to disperse. This incredible technology is made to order specially for these tamarins by Wildlife Materials. and tracking devices are provided by Communications Specialists. At the end of each processing session, it is time to wash off the bleach and admire our handiwork. Those animals without a radio collar receive a beaded collar code that they will keep their whole lives, irrespective of the groups they move to. Although science tells us not to personalise study subjects, there is absolutely no way that that is true of our work - these good looks and such an intimate view into their lives result in us all wrapped around their little fingers. Some 6 hours after capture (which is why we never capture past ~9 am), we release them back into the wild, but the story doesn't end there...read on. They go from being captured...right back to the baited trap. This is our golden moment, the crux of the day, the warm fuzzy feeling. There is no better knowledge for a wildlife biologist than the undeniable fact that her methods have not scared her study subjects. Standing 15 m from them, we watch them binge on bananas before bailing to bed. The final walk back from on a successful day is one of exhaustion mingled with a deep satisfaction at a job well done. Bone tired, over a hundred samples to process, lots of kit to clean, but happy nonetheless to try again tomorrow on another group.